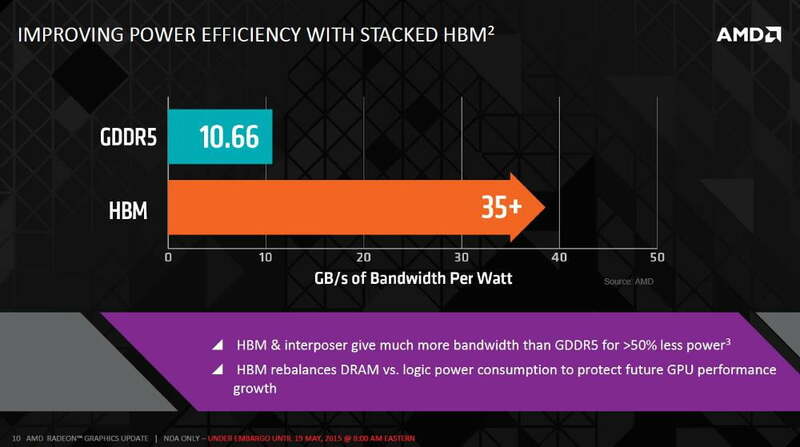 Updated 6/2/2015 8:43 PM: AMD has announced that its first card with HBM memory with launch on June 16th at E3. Original text: Video card memory hasn’t fundamentally changed for over a decade. While manufacturers have leapt to quicker, newer hardware, the basic construction and layout of memory has stayed the same. That’ll soon change, however, with AMD’s introduction of High Bandwidth Memory. AMD says it has been working on this advancement for about seven years. It started the project because its engineers predicted that growing RAM needs would increase the power draw of memory and increase the space memory takes on a card. Those predictions have proved mostly accurate, as GDDR5 is more power hungry, and the space memory takes on high-end cards like the AMD Radeon R9 290X or Nvidia Titan X is substantial. 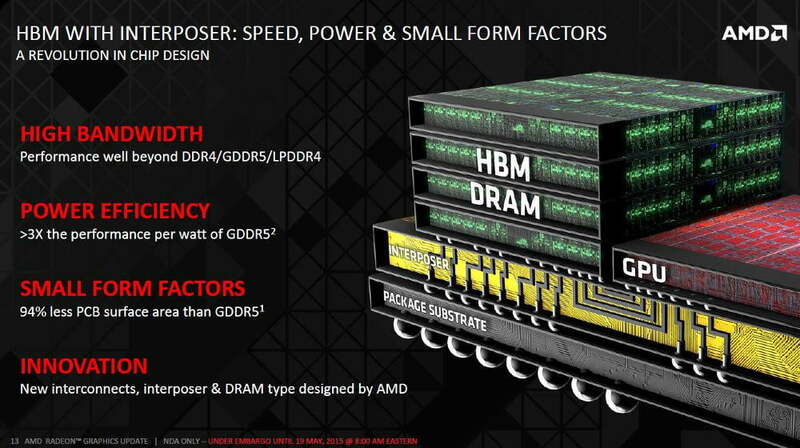 HBM addresses the problem by stacking DRAM vertically, like a skyscraper. Each layer is a “floor,” rising upwards instead of across the card. In the middle of each station is a “through-silicon-vias” which acts like a series of elevator shafts, transferring data through each skyscraper to an interposer, which then can transfer data to other portions of a PC, most importantly the GPU. Does this sound familiar? It might, because it’s somewhat similar to the V-NAND and 3D NAND technology used by Samsung and Intel, respectively, to build smaller solid state hard drives. With that said, though, there’s no direct link between those technologies and HBM – they’re merely similar takes on a common issue facing chip-based storage technology as capacities expand. The construction of HBM does more than allow for greater memory density with lower power draw. It also changes the pathway between memory and the GPU. Because HBM stacks memory, each chip shares a single extremely broad, 1024-bit bus. This contributes to the power savings because a wide bus can transfer more data at a lower clock speed. It also should lead to an increase in overall memory bandwidth for AMD’s upcoming video cards. 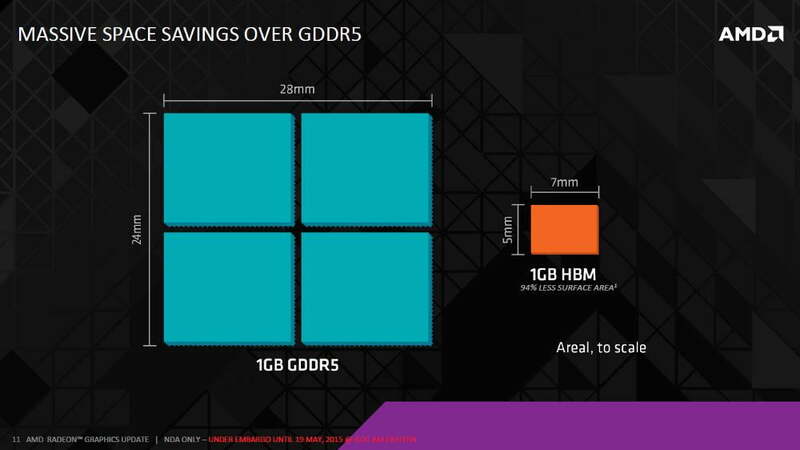 To be clear, the numbers AMD is throwing about aren’t small. The company is claiming memory bandwidth per watt of power consumption will improve more than three-fold. In addition to that, the new strategy will decrease the size consumed by 1GB of GDDR5 from 672 millimeters squared to only 35 millimeters squared. That’s a 94 percent decrease! These facts gel with the leaked AMD video card photos we’ve seen thus far. Those photos showed a high-end GPU that’s about two-thirds the size of most modern video cards, despite the fact its performance is likely to exceed AMD’s current high-end hardware. Unfortunately the company wouldn’t confirm anything about upcoming video cards with HBM, other than to say they’re expected to hit the market within a few months. The technology will appear only on flagship cards to start, then trickle down. It’s also likely to appear in the company’s APUs, which combine a processor and Radeon GPU, but that won’t happen soon. HBM could be a major, necessary advancement in memory technology. It’s no secret that video card size has been on the rise again as of late, and this strategy could reverse that trend. However, AMD is significantly behind Nvidia in overall performance-per-watt, and it’s not clear if HBM alone can close the gap. We’ll just have to wait and see what new hardware the red team has in waiting.